Replacing the original, ground-breaking Zafira in 2005 this second generation model is based on the underpinnings of Opel’s Astra model. Replacing the original, ground-breaking Zafira in 2005 this second generation model is based on the underpinnings of Opel’s Astra model. Like its very similarly styled predecessor it’s a clever seven-seat family car, Opel’s engineers managing to package seven useable seats into a relatively compact package. However, it’s either a generous-booted family machine for five, or seven up with very little luggage. Overall it's economical, solidly built and inexpensive. Something of a mainstay in the compact MPV marketplace now, when the Opel Zafira was introduced back in 1998 it caused a sensation. Until it arrived compact MPVs offered clumsy, heavy seating solutions that often required removing, leaving you with the choice of luggage space or passengers. Opel’s innovative Flex 7 seating prevented this, the rearmost pair of seats cleverly folding neatly under a flat floor. Retaining the same compromised boot space with seven passengers as the competition, it did however make life much easier for family buyers needing flexibility. 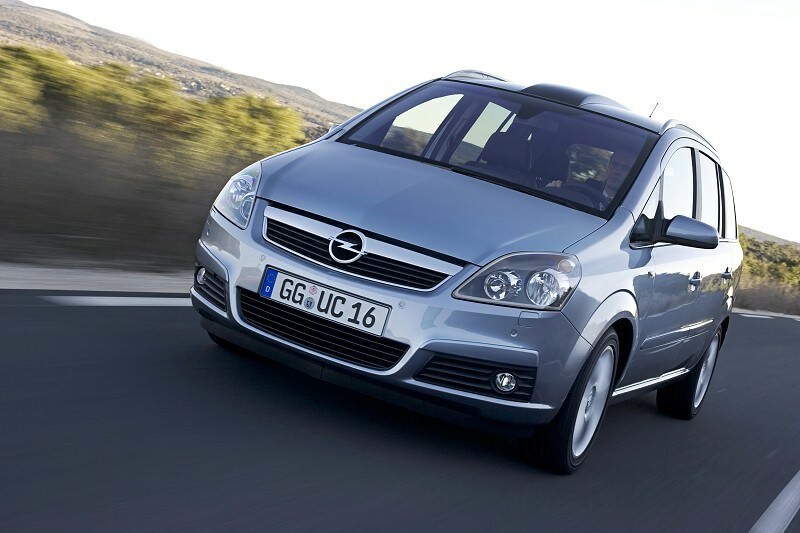 Unlike some rivals there’s no regular and ‘Grand’ model, the Zafira only being offered in one body style. It’s boxy, but then that affords this practical machine its useful interior space. Engines choices have variously included everything from 1.6-litre up to 2.0-litre turbocharged petrol units, but by far the biggest sellers are the diesel choices. Larger 1.9 CDTi models were available until 2010, but it’s the 1.7-litre CDTi that makes up the majority of used models available. Trim levels follow the Opel norm, with Expression, Life, Club, Design, Exclusiv and Elite making up the range. An automatic gearbox is available, though they’re rare, the majority of Zafiras featuring a five- or six-speed manual transmission. You can’t go wrong with a 1.7-litre CDTi Club. With it you get lots of space, decent, if not lightning pace, a useful amount of standard equipment (air conditioning, alloy wheels, colour coded mirrors) and sensible running costs. Official combined consumption is 5.1 litres/100km and CO2 emissions are 134g/km. Two outputs are offered, either 110- or 125hp and the lesser feels little slower, though there’s no economy penalty for having the 125hp version. Once revolutionary, the Zafira’s shine has dulled with age, but if practicality counts and you need seven seats on occasion then there’s little out there to better it as a sensible all-rounder. Decent running costs and plentiful choice should make finding one that suits your budget easy, too.